Zlib is a very common compression format used by many software developers. 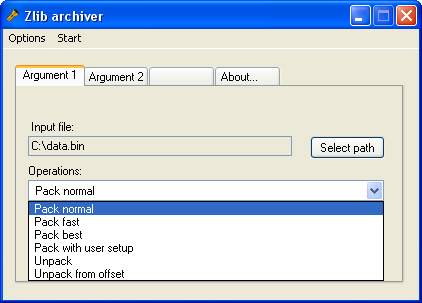 With this Zlib archiver, you can extract or compress the Zlib-compressed files used in the game Twisted Metal 4 for Sony PlayStation, as just one example. You can find more information in the README file. To use the GUI, you need to unpack the utility Console compromise into the same folder as this Zlib archiver.